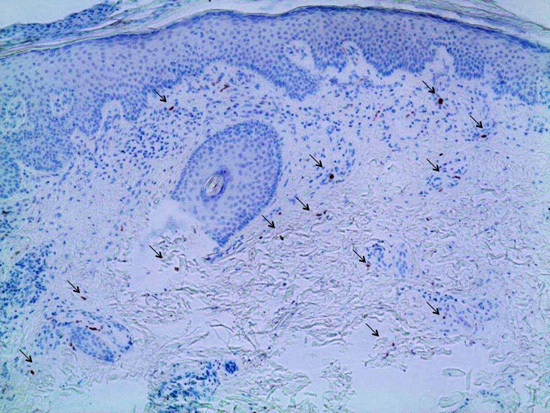 Skin problems may be caused by interferon-β, a common treatment for multiple sclerosis (MS), according to a new study published by a German research group at the Klinik und Poliklinik für Dermatologie, Venerologie und Allergologie, in Würzburg, Germany. The work, entitled “Cutaneous Adverse Events Associated with Interferon-β Treatment of Multiple Sclerosis,” appeared July 2nd in the International Journal of Molecular Sciences. MS can lead to serious health issues involving movement, sensation, vision and pain. These symptoms are due to an aggressive, uncontrolled immune response that the body launches against myelin, a fatty substance that wraps around nerve cells and helps them to communicate. One current approach to treating MS is to suppress a patient’s over-active immune system through the prescription of Interferon-β based therapies. Interferons are normally produced by the immune system and have the ability to shut down immune reactions, which is more commonly known as inflammation. It is not precisely understood what role interferon plays in MS, but it is known that interferon-β can block inflammation in MS and help prevent the loss of myelin. Interferons are approved first-line therapies for MS. Unfortunately, like many medications, side effects often accompany interferon-β treatment and must be weighed alongside their efficacy by both patients and their physicians. Physicians who treat MS need to take possible skin reactions into consideration and endeavor to choose treatments based on whether or not an individual is susceptible to skin reactions. Neurologists should consider monitoring skin reactions and consider clinical information about skin conditions when selecting Interferon-β treatment for MS. Skin lesions may even cause MS patients to stop taking their medication. People who are vulnerable to developing psoriasis may not be good candidates for this medication. In general, more disease modifying treatments with reduced side-effects are needed for the treatment of MS.